But it was hard work. My body is taking its time to remember that this is what we do. Race bikes. Almost every weekend until September. Hope it remembers soon. I don’t want to feel like that again for many more races. 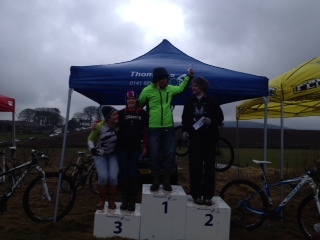 The Forfar SXC round was brutal. Sub zero, wind, rain, sharp climbs, mud, soul destroying grass slogs and all this on a bald Shwalbe Racing Ralph because I set my turbo up wrong in the warm up and tore all its brand new nobbles off. Idiot. Still. It’s done. I won. I have 1hr 30mins of racing in my legs and lungs. I am reminded of this when I depress the clutch of my van or try to laugh. Feels good. What a weirdo.